At Tindale Dental Centre we are pleased we can offer our patients the full options of solutions to replace missing or lost teeth. We can offer restorative solutions which range from dentures to fixed bridgework to dental implants. Our dentists are happy to provide advice on the appropriate solution for you. A bridge may be recommended if you’re missing one or more teeth. A bridge is bonded in place and provides a permanent aesthetic solution to the problem of missing teeth. A bridge is usually compromised of two crowns with a Pontic, or dummy tooth, placed in the middle to replace the missing teeth. As with crowns, you have a choice of materials for a bridge whether it be full porcelain or porcelain fused to metal. Your dentist can help you decide which to use, based on the location of the missing tooth (or teeth), its function, aesthetic considerations. The porcelain colour of the bridge will be matched to compliment the colour of your natural teeth. Dental implants provide patients with a viable fixed alternative to removable dentures. Implants offer patients an aesthetic result which has the benefit of not involving the destruction of the structure of surrounding teeth .These dental implants have a proven clinical history of offering patients excellent longevity and durability. 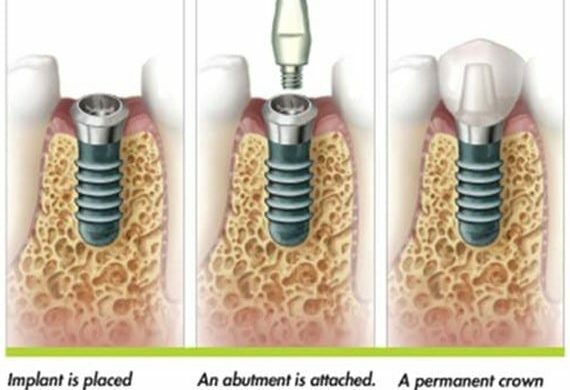 At Tindale Dental Centre we are proud that we can offer our patient comprehensive implant treatment. Our Dental implant clinic led by Dr Alan Trinh and Dr Emma Bond is able to both surgically place the dental implant, under intravenous sedation if appropriate, and then restore the implant with the placement of a crown or bridge. We believe that this highly demanding area of dentistry should only be offered by dentists that have had the appropriate advanced training. 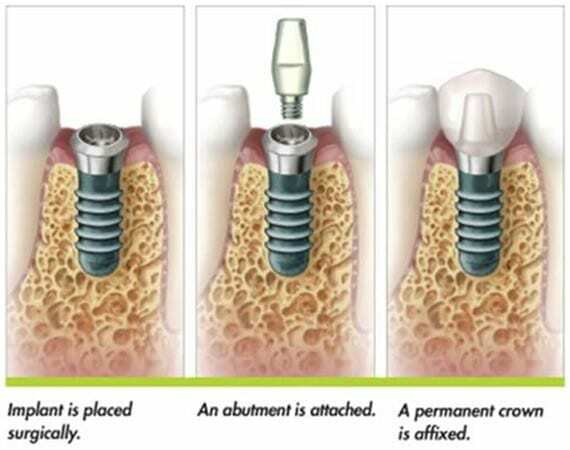 Dental implants are medical grade titanium posts placed into the jawbone as a substitute for the missing tooth root and are then allowed to integrate naturally with the bone (a process called osseointegration). 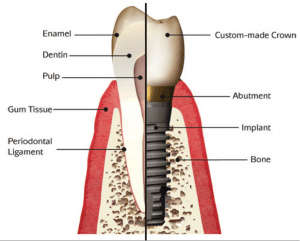 After a period of time a crown, bridge can then be fitted to these dental implants. This process will provide the patient with an aesthetic, fixed alternative to removable dentures.